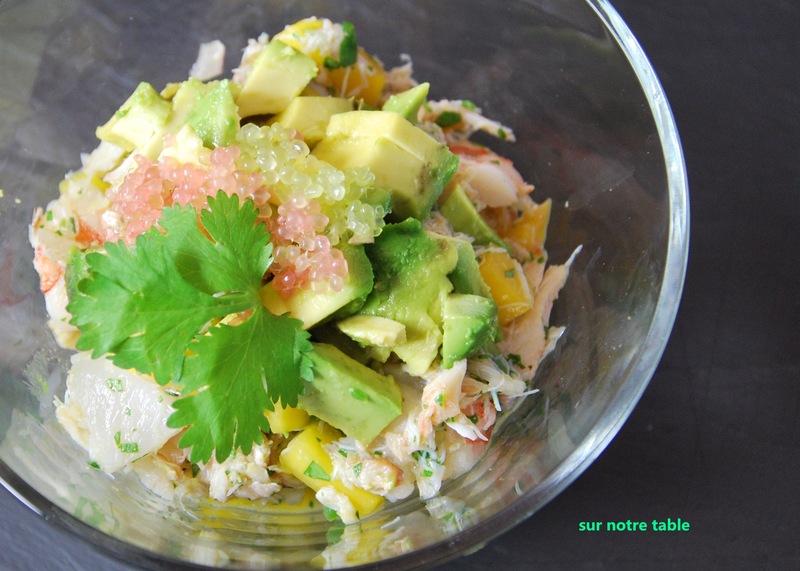 The first signs of spring signal the arrival of fresh snow crab here in Montreal, which means it’s a great time for crab cakes or one of my favourite combination of ingredients, a salad of crab, shrimp and avocado. Now there are many different interpretations of these three ingredients but here’s a fresh take which will be a lot more exciting for your tastebuds. You can also add another level of texture to this recipe by topping the salad with finger lime caviar beads. The finger lime is a cylindrical citrus fruit originating from Australia. The fruit is filled with caviar beads of pink or green color, which has a juice that is acidic and similar to that of a lime. They are not easy to find because of its Australian origin, however the availability of the finger lime is expanding as they are now being grown and harvested in California. Adding finger limes to this recipe is a lot more fun than a lime wedge as the little beads pop and burst and ouze lime juice as you eat them. This recipe is easy as 1, 2, 3, as it only requires cutting and mixing the ingredients. The only time-consuming effort in this recipe is picking the crab meat from fresh cooked crab shells. However you can skip this step and save yourself some time by buying fresh lump crabmeat from the grocery store that is pre-packaged and pasteurized. Obviously you wouldn’t use this stuff for a seafood platter however it’s perfect for this type of salad or a crab cake. When refrigerated and unopened this pasteurized crab meat can last up to a year or so, however when opened it has to be eaten within 3 to 5 days. In a medium sized bowl mix diced mango, olive oil, vinegar, lime juice, cilantro, jalapeno and shallot. Season with salt and pepper. Add shrimp and crabmeat to bowl and combine. 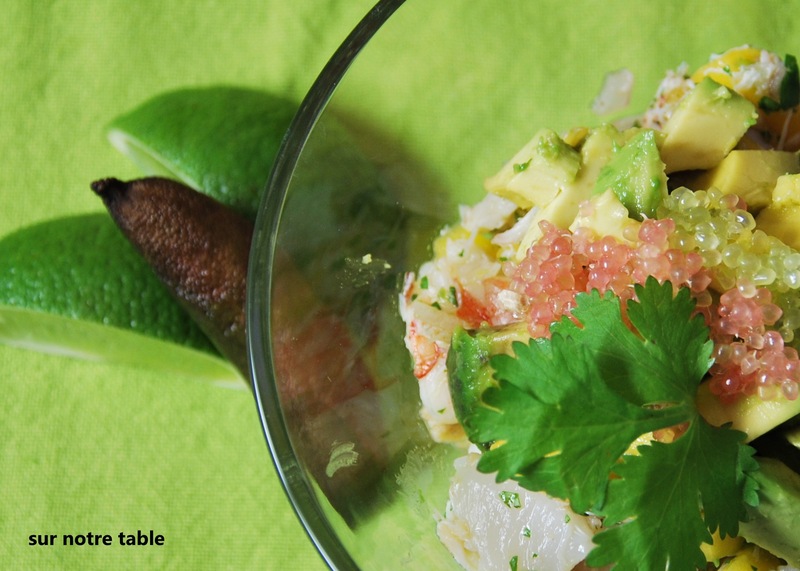 In small serving vessels or bowls first layer crab mixture, then spoon avocado on top and garnish with finger lime caviar or lime wedge if finger limes are not available. Then top with a cilantro sprigs and serve immediately. Voila! Makes for an easy appetizer anytime of the week. Even though both my husband and I are avid meat eaters, we do, of course, enjoy cooking and eating fish as well. In most situations fish is best when it is cooked with few ingredients, so as not to overpower the delicate taste of the fish. 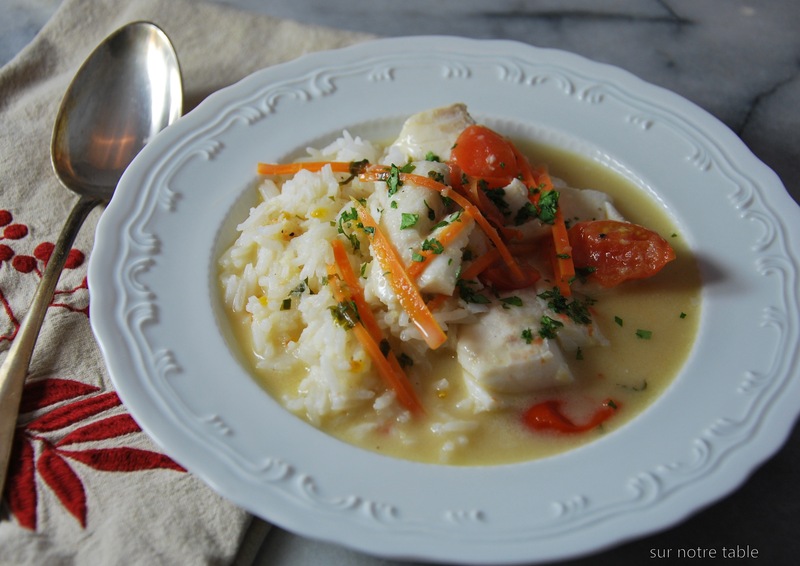 However there are always exceptions and this recipe, cod served with a coconut green curry broth, is one of those favoured recipes. We not only love the combination of flavours but it is a favourite because it is a quick and easy weeknight recipe which requires only one pan. Yes, one pan, now that makes for easy clean up on a weeknight! Heat oil in a large high saucepan over medium-high heat. Stir curry paste and ginger in hot oil for about 1 minute. Pour coconut milk and stir to boil and reduce by half for about 10 minutes. If you wish to lower the fat content, feel free to use light coconut milk but allocate a little more time to reduce the liquid by half. In the meantime, cook rice in a separate saucepan as per instructions on packaging. Once coconut milk broth is reduced by half, add chicken stock, fish sauce, sugar and lime juice to pan. Reduce heat to a simmer and add chunks of cod to broth and poach fish for 3 to 4 minutes. Carefully remove cod pieces from saucepan and divide equally into 2 low soup bowls and keep fish warm in oven at about 200oF. While fish stays warm, bring broth to boil and reduce for 5 minutes. Add carrots to broth and cook for another 3 minutes. Then add cherry tomatoes and basil and cook another 2 minutes. Taste, and if desired, add salt, pepper or more lime as needed. 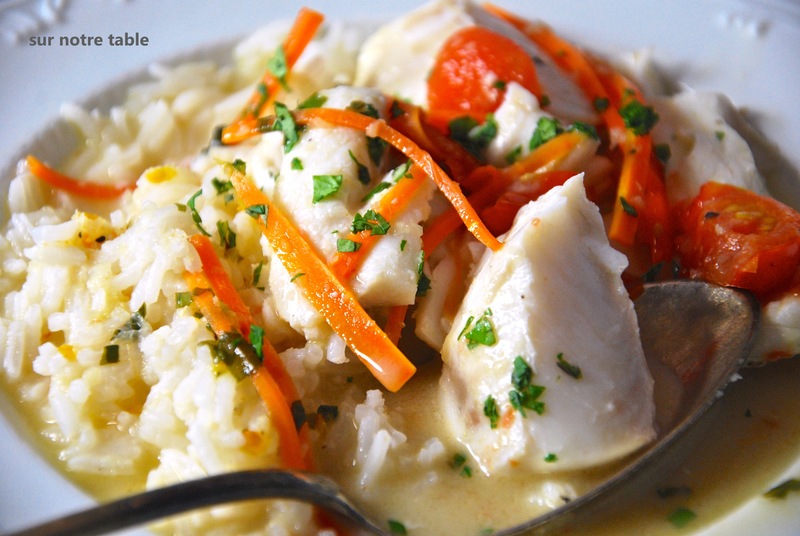 Remove soup bowls from oven and plate cooked rice with fish and pour broth over rice and fish. Garnish plate with coriander and serve. Perhaps this might become a weeknight favourite for you as it is for us! I know, I know, what could be appetizing about this slimy-looking mollusk? You’re probably telling yourself, I’ve never been interested in trying them, or I’ve tried them but they didn’t float my boat, so why should I go on reading this, as there’s no way I’m going to make this recipe! Well, let me keep your interest for one more paragraph or two and try to convince you to give it a shot! For those of you who tried them and didn’t like them it may have to do with the size of the snails. In this case, bigger is not better, they are just too rubbery, and that is certainly not appetizing for anyone. So yes, if you’ve had the big ones, I could completely understand your disdain for them. But go small and I’m certain you’ll be converted. For those of you who have not tried them and may be a little turned off by the idea of ingesting a slimy mollusk, well they will not be slimy, unlike raw oysters, you will be eating them cooked soaking in garlic butter which makes them even more palatable and tender. The best part is that you’re sopping up all that melted garlic butter with crusty bread, which probably explains why I liked them the first time I tried them, as a 5 year old child living in the Loire region of France with my parents. So if a 5-year-old kid approves, it can’t be that gross! If you do decide to trust me on this and take the leap and make escargots à la bourguignonne, don’t even think about buying fresh snails, it’s not worth the trouble of cleaning them, purging them of their toxins, etc… Just buy them canned however do look for the brand which contains the greatest number of snails in the cans, this obviously means that the snails will be smaller. 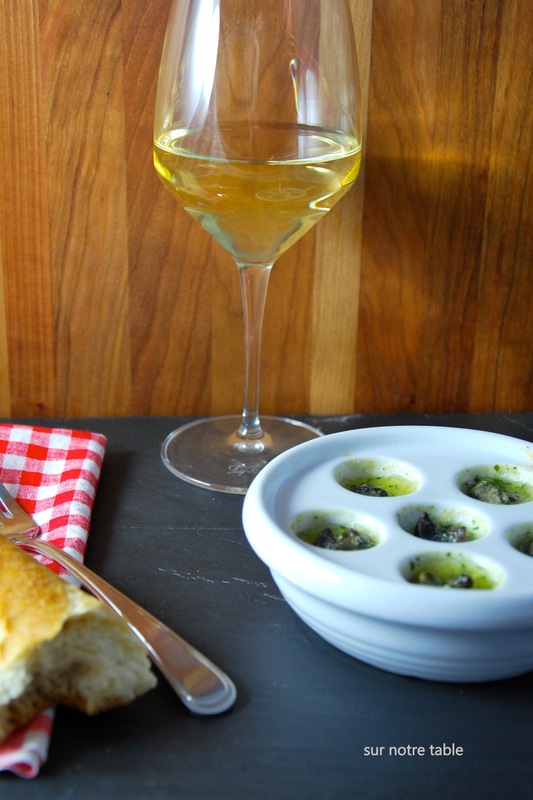 Avoid any can labeled “big snails” or “gros escargots”! There is also an exquisite kind from France, called “petit gris”, and if you’re lucky to find those you’ll be converted forever. Lastly, the other reason I’m so enthusiastic about escargots à la bourguignonne is that they are easy breezy to prepare, they can be prepared in advance, frozen and cooked when required. This makes for a great last minute appetizer. 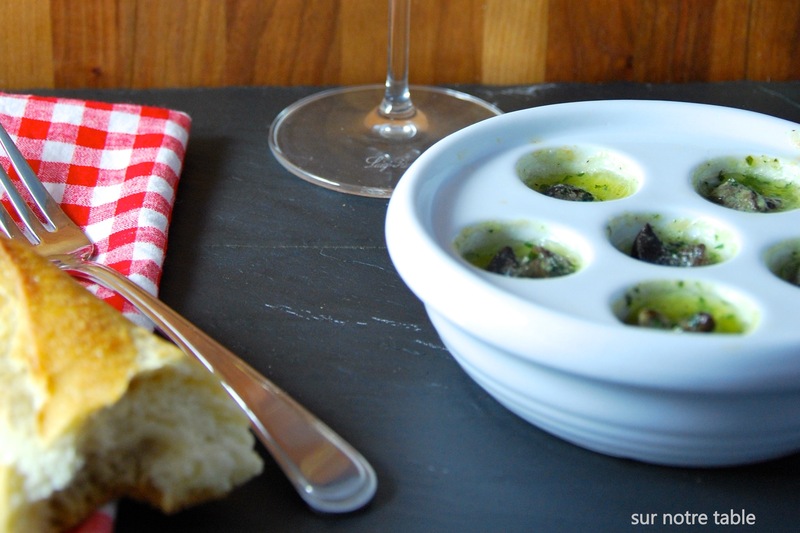 For this recipe you will need porcelain escargots dishes as shown above. Take minced garlic and mash it with salt to create a paste. Combine softened butter, shallot, garlic paste, parsley and pepper and then beat in wine. 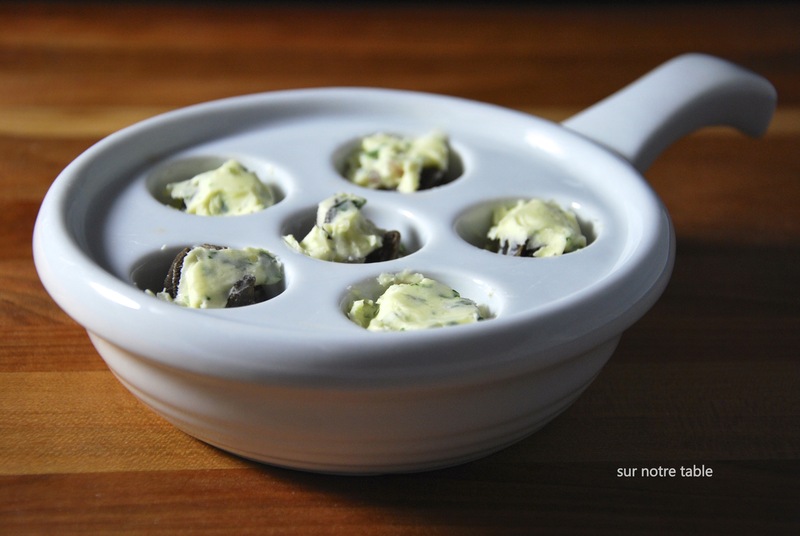 Place ½ teaspoon of garlic butter inside every depression of the escargot dish and place on top of the butter one snail and then top each snail with another ½ teaspoon of garlic butter. At this point you can cover each dish tightly with aluminum foil and freeze until you’re ready to bake them. When ready to bake just remove foil and bake in oven between 4 to 6 minutes, until the butter is melted and is bubbling. 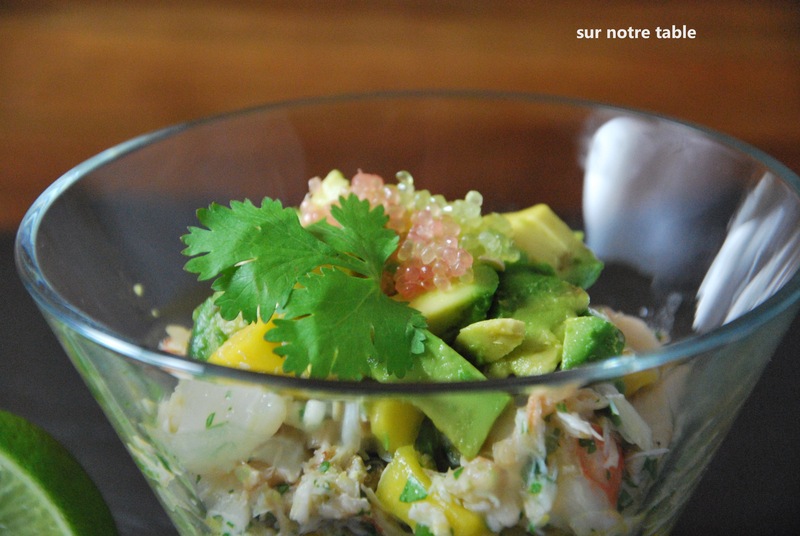 Serve with baguette and a great bottle of white wine, in this case I’m partial to a muscadet!